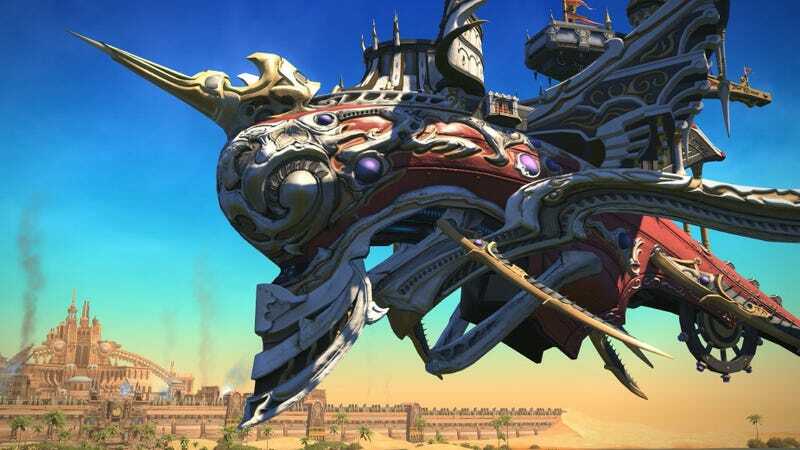 Final Fantasy XIV gets its biggest update since the Stormblood expansion tomorrow, with the launch of patch 4.1, “The Legend Returns.” Not only are players getting new player housing, NPC dungeons and a continuation of the main storyline, they’re also taking a trip to Final Fantasy XII’s Rabenastre, courtesy of guest creator Yasumi Matsuno. When we last left our stalwart warriors of light, they’d just finished performing some pretty amazing feats during the end of Stormblood’s main storyline. My character, the Red Mage Clan Destine, has basically been sitting still since she completed the liberation of Ala Mhigo, with the occasional break to mingle with some Yokai. But that all changes tomorrow. With the 4.1 patch it’s time to figure out what the citizens and leaders of the newly-liberated city state are going to do next. The best thing about Final Fantasy XIV’s ongoing story is that it goes on long after a non-MMO’s credits would have rolled. I’m looking forward to seeing where the plot takes my godlike conquerer next. Even more exciting than that, however, is the “Return to Ivalice” alliance raid event. It’s penned by Yasumi Matsuno, writer of games like Final Fantasy Tactics and Final Fantasy XII. Matsuno’s adventure takes players to the legendary land of Ivalice, where the aforementioned games are set, where they’ll do battle with creatures designed by prolific Japanese designer Keita Amemiya. I’m also looking forward to finally being able to bring my Adventure Squadron into battle. Players have spent the past several months sending groups of recruited non-player character adventurers out on timed missions. With patch 4.1, players can now take their team out into select dungeons, fighting by their side while issuing commands. And for those who enjoy spending virtual currency on things that ultimately do not matter, the new housing area opens tomorrow, offering players and free companies the opportunity to desperately attempt to secure one of a limited number of real estate plots. There’s also new raid encounters, revamped combat mechanics, treasure hunting, the return of fan-favorite inspector Hildibrand Manderville, new minions, hairstyles, emotes and much, much more. Check out the official “The Legend Returns” website for a full accounting of the new stuff. I guess I will see some of you in Eorzea (and beyond) tomorrow, as my free company leader hunted me down on Twitter to drag me back.